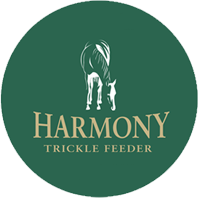 I started using Harmony Trickle Feeders a couple of years ago,having been kindly sponsored by the company. I very quickly noticed the benefits of the trickle feeder system, and it wasn’t long before the whole yard was converted! As a veterinary surgeon & international event rider I felt uniquely placed to assess the merits of the product from two different but equally important view points. I am convinced that the majority of health & behavioural issues that arise in our equine athletes can be directly attributed to how far we have “removed” them from their natural state of being/habitat. Realistically speaking of course these athlete’s environments have to be altered to cope with the demands of their sport & other management practicalities. However, if we can allow them to pursue one of their most basic natural activities, ie. grazing/eating, as if doing so in the field, then something profoundly beneficial has been achieved both mentally & physically in my opinion. I read a very interesting paper recently which very much confirmed my concerns with regards feeding horses hay/haylage at an unnatural level, ie. Hay nets/racks from the wall. This study found that there was considerably less muscle tension in the top line of horses that ate from ground level than those eating from racks/nets. In addition, cervical spinal alignment was shown to be adversely affected by abnormal feeding positions. 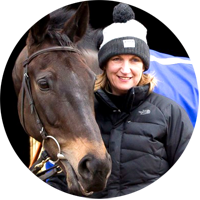 Practically speaking, this has been proven in my yard by the positive feedback from our Physio since the introduction of the feeders, as well as a noticeable improvement in the horses suppleness both on the flat & over fences. The two main problems with just throwing hay on the stable floor are (a) waste & (b) dramatically reduced fibre chewing time (which has been proven to be one of the main causes of gastric ulcers in competition horses, and an often over looked cause of poor performance). Before introducing the harmony feeders, I had two horses in the yard on long term anti-ulcer treatment, which was both costly & frustrating. Within 6-8 weeks of being fed with the feeders, gastric scopes of both horses showed no evidence of ulceration & I was able to discontinue treatment!…. RESULT! The harmony feeders had paid for themselves in my yard in less than a year, both in terms of waste reduction & medical expenses. Maintaining a healthy respiratory system & managing the yard to achieve this is probably one of my main priorities. The respiratory damage caused by something as basic as a horses feeding position can be very underestimated. 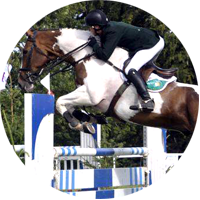 Competing at the highest level, or indeed any level comfortably & efficiently is next to impossible if our horses wind is not optimal. Mucocilliary clearance of fungal spores, dust, harmful microbes etc. is directly affected by feeding position & is fundamental to our horses respiratory health. Conditions such as C.O.P.D., guttural pouch mycosis, persistent lung infections, respiratory bleeding etc. are very much reduced by feeding position & pattern in my opinion. Another welcomed benefit to the harmony feeding system in my yard was with a particular mare I had in work who had a serious penchant for wind sucking! This particular vice can damage/wear down incisor teeth & occasionally lead to colic if excessive amounts of air are taken into the digestive tract. Apart from the physical reasons, I dislike seeing horses in the yard do such things as it is invariably a physiological response to a perceived “stress”, such as boredom, excessive time spent in the stable etc. Interestingly, horses with gastric ulcers can engage in this habit also. In my mare’s case, the wind sucking didn’t stop completely upon the introduction of the feeders, but the frequency of the behaviour reduced dramatically to the extent that I would rarely catch her doing it anymore!.. Again, the harmony feeing system providing me with practical evidence of its benefits. I would say that one of the most important, cost effective & beneficial decisions I have made in the running of my event yard was the introduction of the Harmony trickle feeding system. Healthier, happier horses grazing as nature intended. THANK YOU Harmony!! We are using the Harmony Equine Hay Feeder in our yard and find it particularly beneficial for horses who have a tendancy to box-walk. In fact, we have seen horses stop box-walking when using Harmony because they have haylage constantly available to them throughout day and night. Also important to us is the fact that the horses are now feeding at ground level which has always been our preferred way of feeding haylage to our horses, but now we can do it in such a way that allows the horses to trickle feed rather than having them pull the haylage around the stable which in turn means that we are also noticing a reduction in the amount of haylage wasted. Overall, we are very satisfied with our purchases and are seeing real benefits from using the product ! I have found the feeder to be really useful this winter with one of the horses on box rest. It controlled the speed at which he was consuming his haylage and I felt it was better for maintaining his top line by mimicking the normal grazing position. Gorsehill Meastro is not your normal 17.2 horse and loves his divilment. He spent all his days trying to get the feeders hat off and legs off. But despite his persistent efforts the team at Harmony had a custom solution. He loves his new Toy soldier. ” Hats off to all. We find the feeder very easy to manage and clean, it''s easy to hose down and horses are feeding very well from the units. We have also found the feeder to be very effective in managing a horse with a sinus problem because he is now eating constantly at ground level. Since we started using the feeder, he has not had any issue with sinuses. The Harmony Equine Hay Feeder addresses a number of problems associated with feeding forage. I''m a big believer in horses eating off the ground, as they would when grazing naturally. I often hear physiotherapists advising the same as it is generally very beneficial to horses who suffer from stiffness in their back. The Harmony feeder also prevents the horses gorging on their hay and eating too quickly, and it also stops the hay getting mixed into the bedding, making it very efficient. Jenny is 24 now and slow feeder haynets aren''t suitable really as I would have to hang them high- which I cant do due to the sinus issues we have been having and also her teeth wouldn’t be as good as they used to be so using a haynet with small holes would be challenging for her. She has Cushings disease so managing her diet is critical! She is on a specific forage based mineral balanced diet.....as such her hay is the key to her diet and the Harmony Hayfeeder from Equiniche Sciences Ltd is a dream product that has come to reality for her - Thank you so so so much!!!! So a quick update on the Harmony Hay feeder-WE LOVE IT!! We have had a good look at it and it''s so clear that incredibly careful thought and design has gone into the feeder. 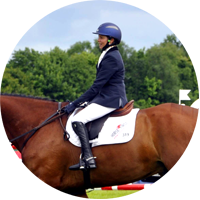 Every function from feeding to filling is totally brilliant, particularly the rubber bars which are flexible enough to allow the horse to ''graze'' without letting him gorge himself. The horse using the feeder seems more mentally satisfied but better again, he is actually finishing all of his hay every time-something he never normally does. I will never use anything else ever again, it''s that good!!! We highly recommend the use of the Harmony Hayfeeder in all-weather paddocks. It keeps the hay dry, reduces wastage and, most importantly, allows the horses access to roughage throughout their turnout time. It is safe, easy to clean and refill and ultimately saves us a lot of time. I am so pleased with the Harmony hay feeder and the brilliant help and support I received when and after I bought it. It is very well designed and built and will, I am sure, provide many years of service. My young horse has had no issues adapting to it and is now much more relaxed when eating. It is easy to clean, the adjustable bars work very well and no hay is wasted. The perfect solution to all the problems associated with hay nets. It's worked a treat and following rescoping she's gone from grade 4 to grade 1 and now it's not a problem thank goodness.. Just wanted to let you know and thank you for your help.